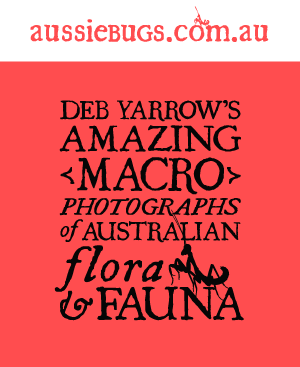 A featured collection of macro photos of ants carrying a variety of organic matter including larvae, food and waste. 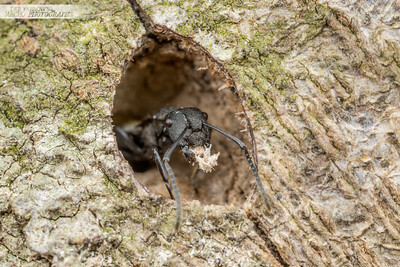 Rattle ant (Polyrhachis sp.) grabs the nearest brood member when the nest is disturbed and waits for trouble to pass. Oxley Creek, QLD. 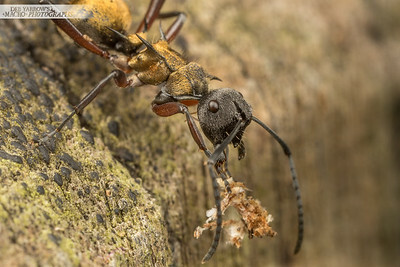 Polyrhachis rufifemur worker drops freshly excavated timber off the side of a fence post. Oxley Creek, QLD. 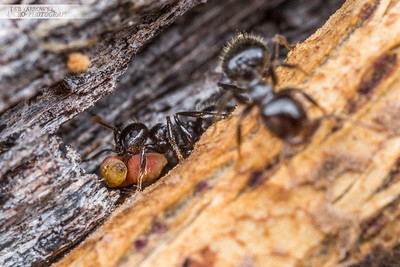 Ochetellus workers relocate their brood after being disturbed by me. The nest was located in the frass of a borer on a tree branch - I imagine an easy nesting material to make use of. Oxley Creek, QLD. 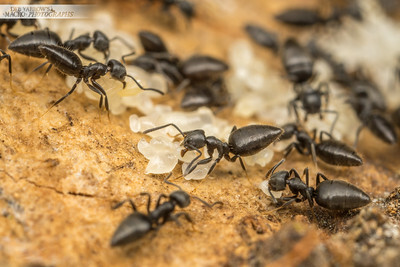 Rainforest ant (Leptomyrmex cnemidatus) magically keeps her clump of grubs together as she walks them through the rainforest. Bunya Mountains, QLD. 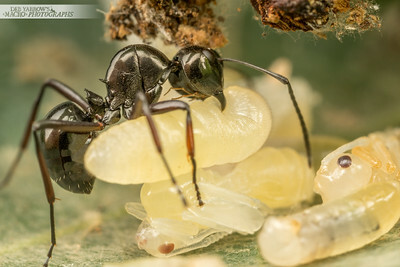 Rhytidoponera worker moves a pupa to safety after the brood was disturbed by yours truly. Bunya Mountains, QLD. 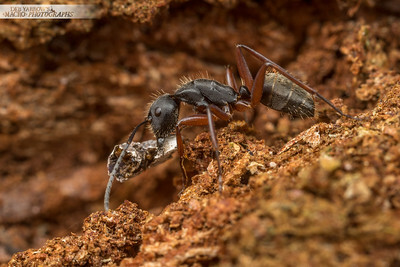 Black carpenter ant (Camponotus sp.) carries a thing around a tree trunk. Mt Glorious, QLD. 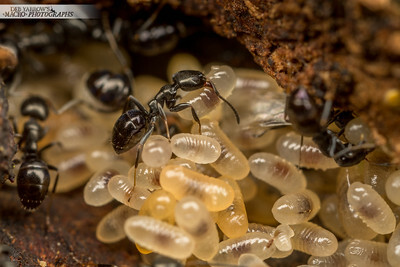 Technomyrmex ants nesting under bark carfully relocate their brood of eggs, larvae and pupae after being disturbed. Oxley Creek, QLD. 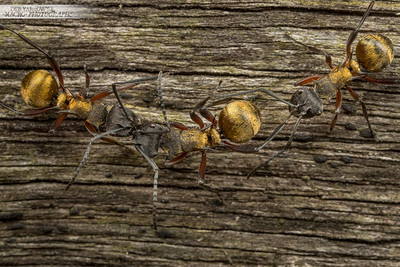 Two golden spiny ants (Polyrachis sp.) wrestle with the middle ant which appears identical. It's obviously offended them somehow. Oxley Creek, QLD. 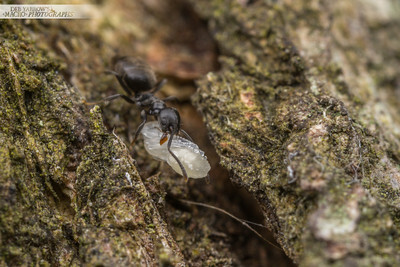 Crematogaster ant carries part of a moth carcass up a tree. Oxley Creek, QLD. 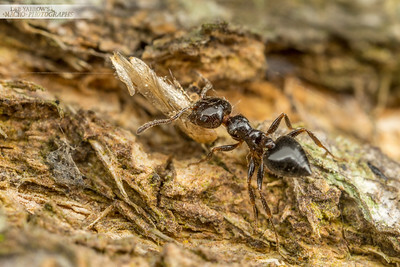 Podomyrma worker ant throws out debris from a nest entrance. Oxley Creek, QLD. Spiny golden ant (Polyrhachis sp.) throws debris out of the nest entrance. Oxley Creek, QLD. 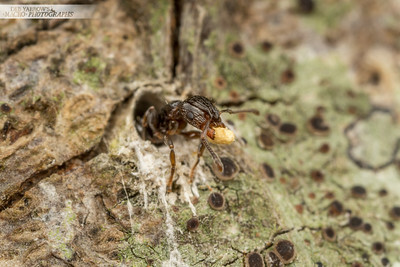 Technomyrmex worker ant is one of many carrying pupae and eggs down the trunk of a tree. Oxley Creek, QLD. 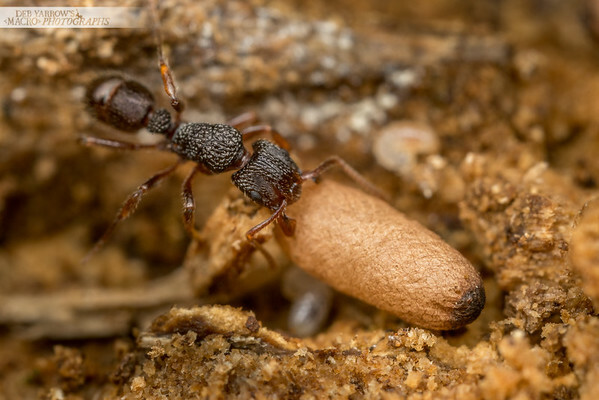 Crematogaster worker ant carries what looks like lunch but really could be anything. 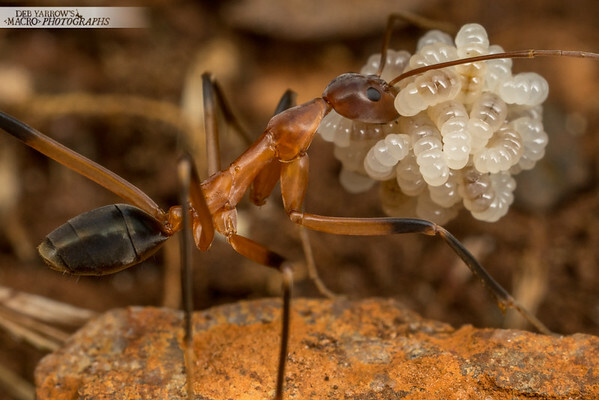 You can't assume with ants, they're cleverer than you think. Bunya, QLD. 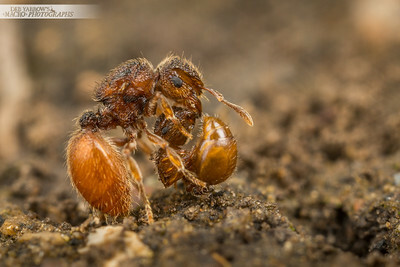 Shield ant queen (Meranoplus sp.) carries a worker from the nest. Toowong, QLD.